Inspired by the simplicity and beauty of nature and its materials, Wieteke designs smaller items inspired on craft and natural beauty. 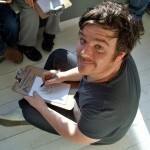 She also makes drawings and illustrations. Designing sustainably and conceptually for over 10 years, she shares her knowledge and experience by teaching workshops and masterclasses in conceptual sustainable design as well as various practical crafts to students and individuals. 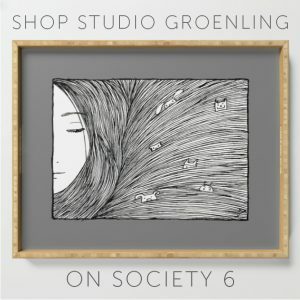 Wieteke Opmeer Design is a small one-woman business in poetic sustainable eco friendly products and art projects that tickle your imagination. Wieteke participated in the ‘Meesterlijk’ fair at Dutch Design Week with her collection ‘Leaves Impression’ and in exhibitions in various museums and venues such as Modemuseum Hasselt (BE), Centraal Museum Utrecht (NL), World Fashion Centre Amsterdam (NL), Bread & Butter Berlin (DE), Mode Fabriek and RAI Amsterdam (NL). She has been nominated for various talent prizes. 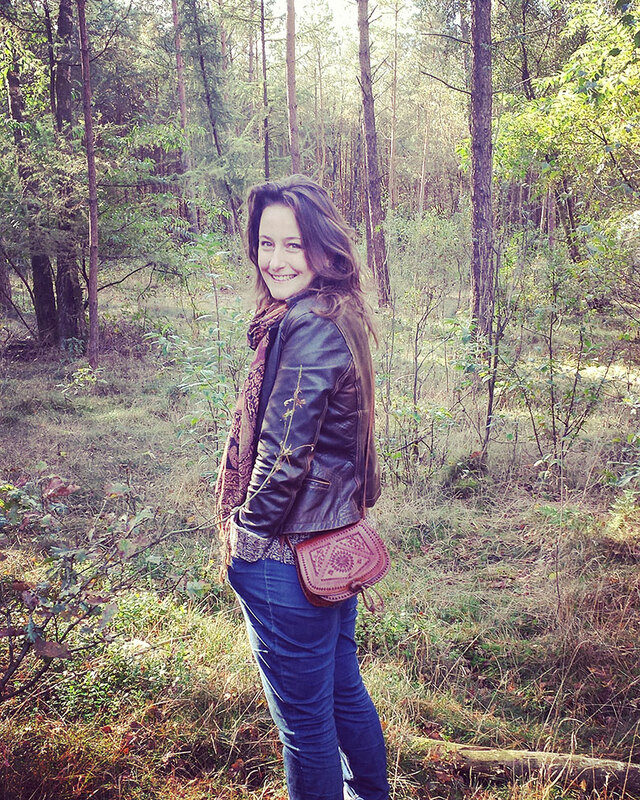 We asked Wieteke a few questions about how she strives to live and work in a sustainable way. 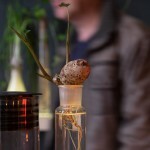 How does living sustainably translate to your everyday life? I am conscious concerning sustainability and environmentally friendly choices of my everyday life. It translates into only trying to use environmentally friendly detergents, I repair almost all my clothes and other items if possible. If I buy something, I buy mostly second hand. My food is for the biggest part organic or even homegrown. My love and I also started the adventure to build our own sustainable house with a large vegetable garden. So I guess I might be a bit more conscious about sustainability than the average person. But aside to this, I think it is also important to note that I am not a purist. I personally find it enjoyable to live and design/create in a sustainable way. But I also think that if I where to try to live for 100% ‘sustainably correct’ it would limit my creativity and lust for life. It would feel like a punishment that I could not do certain things and result in feeling limited in my choices. For me personally the most important part of living the way I live, is to not take away the freedom of choice. I just try to make choices consciously. This almost always result in sustainable choices. In my work I also try to not ‘preach’ to people ‘how to be better’ because that is not something I want to convey. I just want to share the beauty and joy I see and feel when I experience the natural world around me. 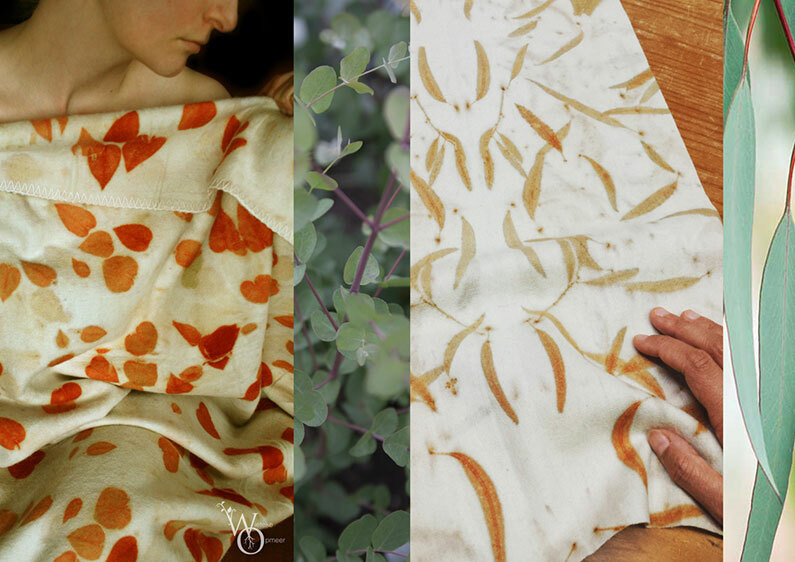 ‘Leaves Impression’ is a collection of eco-friendly dyed pillows, blankets and scarves in high quality organic wool velours, wool etamine and organic animal-friendly (Antung) silk, using leaves of the Eucalyptus plant. During the manufacturing process water and material consumption is low, the absence of toxic additives in the dye bath ensures that the excess water can be returned to nature without poluting and the plant material can be composted. The collection, presented at Dutch Design Week, has been in numerous exhibitions and was sold at various locations throughout the Netherlands. Before studying Free Product Design, you studied Floristry. What made you choose that path? Since I was a child I was always fascinated by nature. Growing up my father was a tree specialist and my mother was always sharing her creative adventures with us. 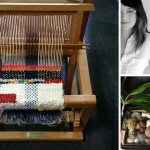 Drawing, knitting, spinning, cooking and growing food for our family in our backyard. Nature and creativity was therefor always close to my heart. I didn’t know exactly what I wanted to do when I grew up, all I knew was that it had to do with nature and creativity. So choosing my florist education was a choice I made easily. I loved spending time in the large greenhouses learning the latin names of all plants and flowers as if they where peculiar aunts and cousins. During the flower arranging lessons I was very experimental and always searching for the next level of creativity with these living and green materials. I eventually decided to try to develop also this creative and experimental side of me at art school. I was very eager to combine my fascination for creativity and the natural world in products and artworks. ‘Zaaisieraad’ Dandelion seeds. Temporary in nature and fashioned out of water soluble fabric and seeds of wild flowers, after wear these necklaces can be placed in nature and will dissolve completely. Over the course of time, wild flowers grow on the spot where they were left. These necklaces philosophically evoke the wearer to think about value and interaction. 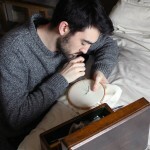 How important is making personal work, as supposed to commissioned work? Personal work for me is a way of expressing myself in an uncensored way, not always resulting in something ‘useful’ or ‘profitable’. Commissioned work also has the possibility of expressing my views, but taking in account usefulness and possible other trades wished for within an assignment. I always feel that creating is in my blood, no matter what I would do. Personal work is the purest expression of this. Commissioned work is also exciting but in another field of my expertise. I compare it to apples and pears, they both are different but healthy and delicious. If I would only get to eat just one of these two fruits it would be very boring and not very healthy. For me finding the right balance between personal work and commissioned work is very important. It keeps me grounded and creative if the balance is just right. 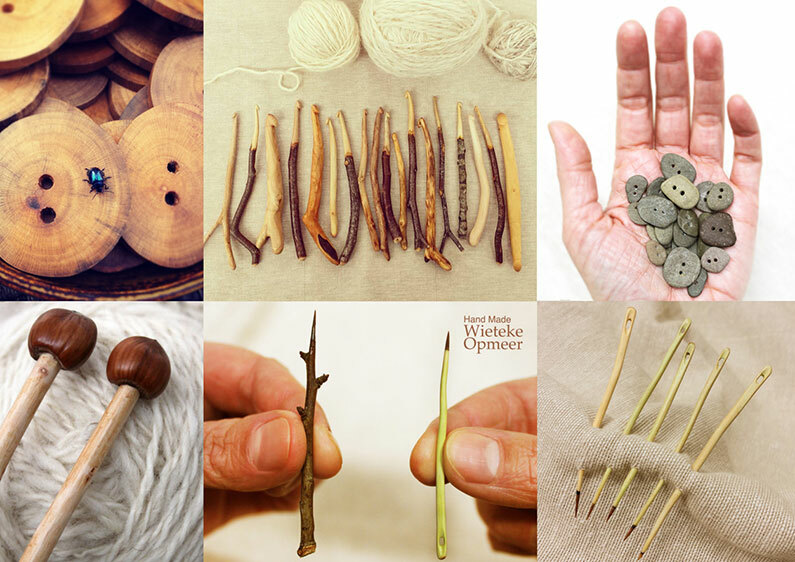 The various artisan collections ‘Botanical’, ‘Wild Forest’ and ‘Wild River’ consist of crochet needles, thorn needles, wooden and stone buttons and knitting needles with acorn ends. All items are handmade from found wood and sometimes special types of wood from the oldest botanical garden in Europe, Hortus Botanicus Leiden. 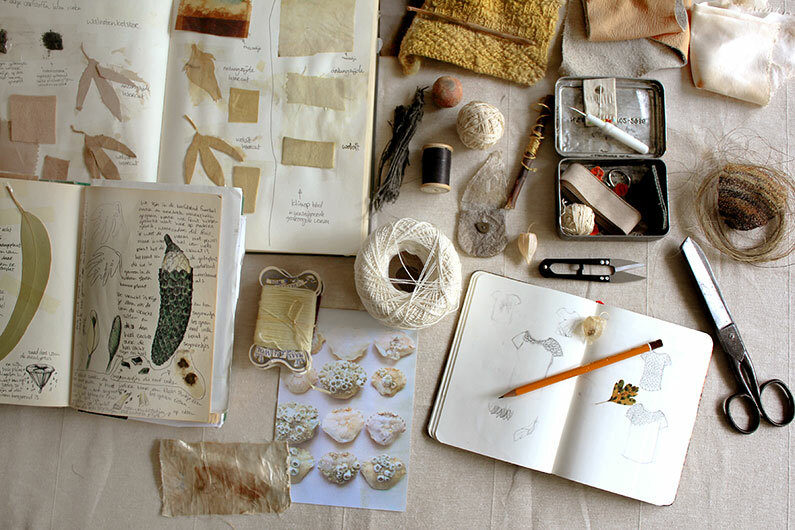 Each piece evokes the user’s awareness of the possibilities of nature and crafts in this digital world. How have you experienced teaching masterclasses and workshops so far? I have recently started sharing my knowledge in creative development and sustainability. I have discovered I absolutely love giving workshops and masterclasses. To meet and be able to coach so many different kinds of interesting people is a joy. Seeing the changes one masterclass can have on how people think or create is something which has surprised me every time. After these recent experiences I am working on a longer lesson program to give people curiosity in their creative development, new skills in various crafts and of course a lot of fun. I can’t wait to share this with everyone, once of course I finished planning this. Impressions of recent masterclasses and workshops. 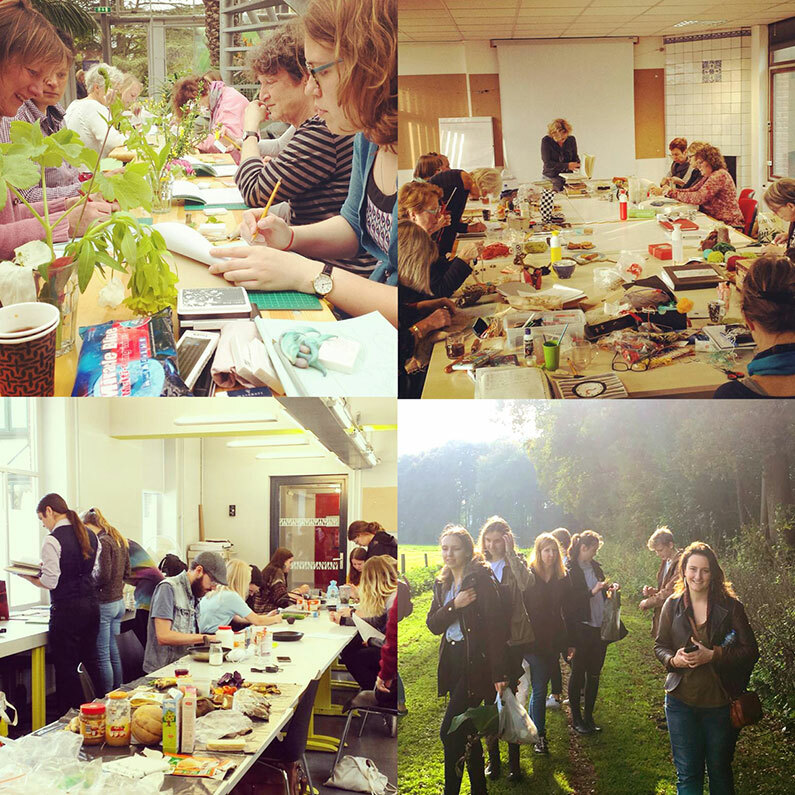 In reading order: workshop at hortus botanicus Leiden, masterclass on location Teqstiel, Nijkerk, masterclass at textile museum Tilburg, workshop at Hogeschool Utrecht for design students. You also started working on illustrations and drawings, can you tell a little more about this? As a child I had, next to a fascination of the natural world, a strong fascination for stories and illustrated books. My imagination would run wild as soon as I saw beautiful drawings an illustrations. Starting at a young age I started drawing and experimented with making various illustrations. After finishing Floristry, I actually doubted between studying Illustration or studying Free Product Design at the art academy. Eventually I chose on Free Product Design because it was so broad that I knew I would find my own creative way. My education was more focused on product design and I always thought it was wise to keep the focus straight and keep on only making beautiful handcrafted products. Various illustrations by Wieteke. 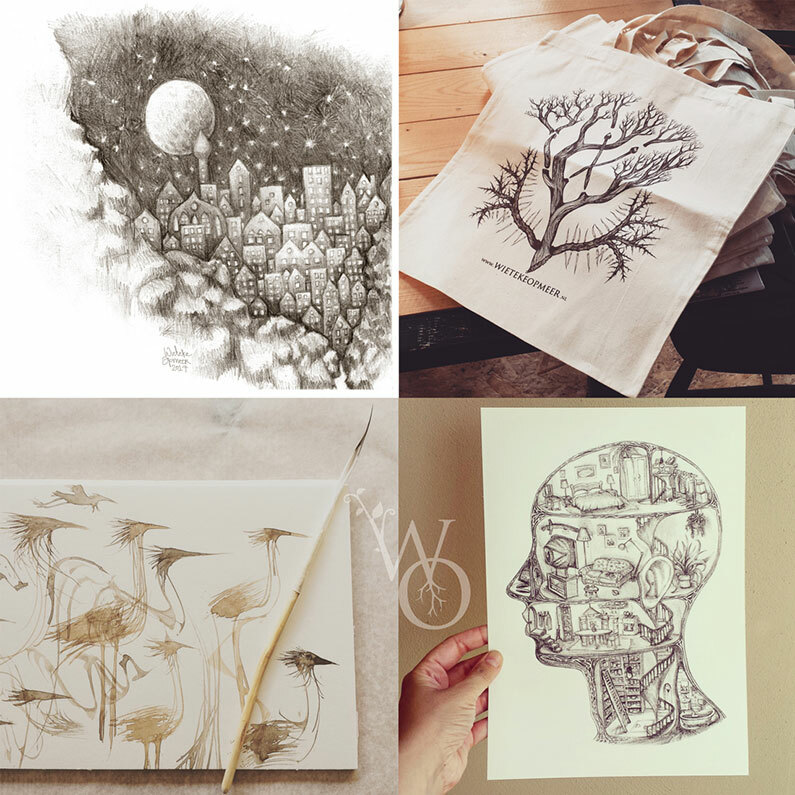 In reading order: illustration ‘night over moonstone citadel’, organic cotton totebag with screenprinted ‘origins illustrations’, bird sketches with handmade feather brush, risoprint of illustration ‘mind dwelling’.